4 + = 9 Required Please enter the correct value. The DJIA Index retreated sharply during the last 30 minutes of a busy trading session, erasing an earlier gain of more than 100 points. The sell-off comes the day before earnings season kicks off and the Federal Reserve releases minutes from the most recent FOMC Meeting. Healthcare stocks were the best performers from the S&P 500, as biotech shares shook off four consecutive days of losses. The Nasdaq Biotech index (INDEXNASDAQ: NBI) and the iShares NASDAQ Biotechnology Index ETF (Nasdaq: IBB) added nearly 1% on the day. Traders are champing at the bit to read the minutes of March's FOMC Meeting for any clue of when the central bank might raise interest rates. This morning, Minneapolis Fed President Narayana Kocherlakota, one of the bank's most notable doves, said the Fed should wait until the second half of 2016 before raising interest rates, then raise them gradually to 2% by the end of 2017. Oil prices continued to surge this afternoon, hitting their highest levels since December. Improved U.S. economic data and government forecasts of curbed future production are helping turn prices upward. Brent oil, priced in London, added more than 1.7% to $59.10 per barrel. Meanwhile, WTI crude, priced in New York City, added more than 3.5% to hit $53.98 per barrel. Stocks to Watch No. 1, Energy Stocks: Multinational energy producers remained in focus today as oil prices continue their strong run. Exxon Mobil Corp. (NYSE: XOM) and Royal Dutch Shell (NYSE: RDS.A) rose 0.73%, while Chevron Corp. (NYSE: CVX) jumped 1.52% on the day. Independent, small-cap domestic oil producers and engineering companies saw the greatest benefit Tuesday. Shares of Halcon Resources Corp. (NYSE: HK) gained 8.65%, Tidewater Inc. (NYSE: TDW) rose 8.63%, and McDermott International (NYSE: MDR) gained 7.42%. Stocks to Watch No. 2, TWTR: Twitter Inc. (NYSE: TWTR) stock jumped 3.99% to hit a six-month high. Company shares rose after Barron's reported that the social media firm has hired advisers at Goldman Sachs Group Inc. (NYSE: GS) to deter any future takeover bid. Unsubstantiated rumors hit the street today that Google Inc. (Nasdaq: GOOG, GOOGL) could be a potential suitor, although other tech giants have been linked to the micro-blogging site in the past. Stocks to Watch No. 3, FDX: Shares of FedEx Corp. (NYSE: FDX) jumped nearly 2.7% today on news that the shipping giant will purchase Dutch rival TNT Express NV (OTCMKTS ADR: TNTEY) for 4.4 billion euros ($4.8 billion). TNT Express is Europe's largest shipping company, and the deal gives FedEx a stronger hold in the continent's markets. Rival United Parcel Service Inc. (NYSE: UPS) attempted to purchase TNT Express two years ago for 5.2 billion euros, but regulators rejected the deal. 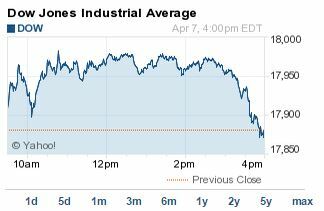 UPS shares were down marginally. Stocks to Watch No. 4, AAPL: Shares of Apple Inc. (Nasdaq: AAPL) retreated more than 1% this afternoon on concerns that the technology giant may see increased competition from Microsoft Corp. (Nasdaq: MSFT) in the mobile payments business. Microsoft recently became the first company in the United States to obtain a money transmitter license. Microsoft's software capacity, industry knowledge, and additional tech platforms will raise the stakes in the sector. Stocks to Watch No. 5, GM: Shares of General Motors Co. (NYSE: GM) fell more than 2.5% on news that Canada GEN Investment Corp., a federal agency, plans to divest 73.4 million shares of the Detroit automaker. In an effort to clean up its balance sheet ahead of national elections, the Canadian public agency will sell the stock to Goldman Sachs for an undisclosed sum. Every day we give investors a "tip of the day" to find their best profits. Today's tip comes from Money Morning Tech Expert Michael A. Robinson. I love corporate spin-offs. It's like getting two stocks for one, and research shows the spun-off company typically outperforms the market for two to three years. Lehman Bros. studied 85 spin-offs and found they beat the S&P 500 by as much as 45% in their first two years as independent companies. In a Penn State University study of 174 spin-offs, the new companies showed price appreciations of 76% in their first three years of operation, beating the S&P 500 by 31%. But when eBay Inc. (Nasdaq: EBAY) spins off its PayPal division later this year, the profit potential will be even greater. Here's why…. First, the more disruptive the technology, the more likely the spun-off firm will both outperform its parent and smash the overall market. PayPal has long been a leader in digital transactions. And it's making big moves in the rapidly growing mobile payments industry, expected to hit $1 trillion in transactions in as little as a decade. Mobile payment volume at PayPal in 2014 was just 20% of its total. But we can expect that percentage to grow as PayPal continues to innovate its "mobile wallet" and make strategic acquisitions. Second, PayPal is setting itself up as one of the go-to firms in the mobile payments industry. That makes it a big takeover candidate. By investing in eBay now, you get two things. First, you get the parent company – a solid long-term e-commerce play. Second, you will automatically get shares in PayPal, a rapidly growing firm with strong ties to what could be the tech story of the year – mobile payments. That gives your portfolio both a solid foundation and a bonus stock that will give us maximum profits.